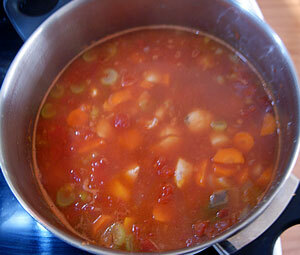 If you love chicken or thick, rich soups then you will love this chicken minestrone recipe. 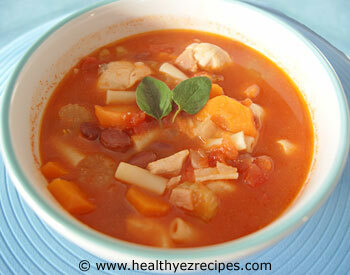 This soup is a wonderful variation of the traditional minestrone. A rich hearty soup filled with chicken, vegetables and macaroni. This is one of my favorites and is so substantial that it can easily be a meal in itself. Simply serve with crusty bread or cheesy croutons and you have a tasty, nutritious lunch or dinner for your family. You will need a large saucepan or a stock pot. Prepare your vegetables. Dice the onion and chop the celery. 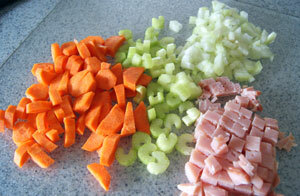 Cut the carrot in half lengthways then dice into pieces. Chop the bacon. I used shortcut bacon with all the fat removed for this recipe to make it healthier. Chop the chicken fillets into bite-sized pieces. Heat 1 tablespoon oil in a pan and add chicken. Cook until the chicken is cooked and sealed on all sides. This will seal in the juices. Remove from the pan. Heat the remaining oil in the pan and add the onion, garlic and bacon. Cook for about 5 minutes. 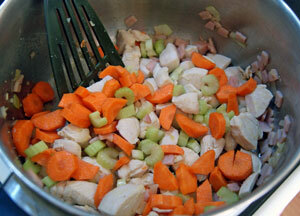 Stir in the celery and carrot and cook for a further 5 minutes. Return the chicken to the pan. Drain the kidney beans and add to the pan, along with the undrained, crushed tomatoes, water, crumbled stock cube, bouquet garni and macaroni. Bring to the boil then reduce the heat. Simmer, uncovered for about 30 minutes, or until the macaroni is just soft. Stir in the herbs and simmer for a further 5 minutes. To serve, remove the bouquet garni and ladle into serving bowls. This soup is suitable to freeze.